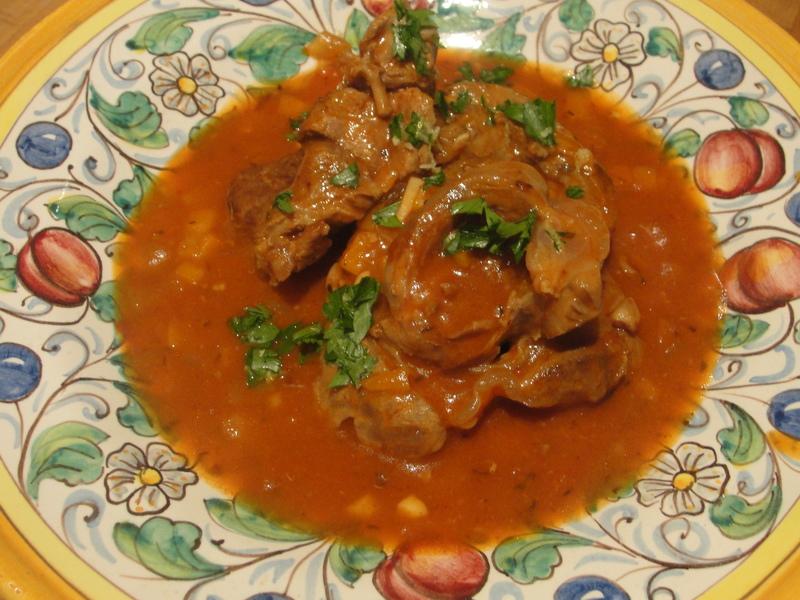 Osso Buco with Gremolata – Gina Diamond's Flower Co.
October 14, 2015, posted by Michelle – This is so easy to make and absolutely delicious. Do not skip the gremolata, the bright citrus punch it gives is the very thing that takes this dish over the top. This is usually served with risotto or polenta. Directions: Salt the veal shanks on both sides. Add a little olive oil to a large pot and brown the veal shanks on all sides. Remove and set aside. In the same pot, add a little more olive oil and sauté the onions and carrots for a few minutes. Next, stir in the chicken bouillon, flour and wine and let the liquid reduce by half. Add the tomatoes, half of the minced garlic, thyme and bay leaf. Finally, add the veal shanks back into the pot. Cover and simmer on low heat for 2 hours. Directions for Gremolata: Mix together the parsley, lemon zest and the other half of the minced garlic. Sprinkle over the osso buco just before serving. When I come to France I want you to make this for me!! !